I imagine when the day comes that I’m living on that quaint, scenic, stretch of land in rural Italy, this is the kind of thing I’ll have for lunch every day during artichoke season. And, there will be wine from nearby and olive oil from my neighbor of course. I do live a rich fantasy life. Until then, I can now get locally grown artichokes right here at home, and I’m very excited about that. The other day, I went on a bit about our local Austin food scene and incredibly fresh asparagus, and then we received artichokes for the first time ever from our CSA. I was beyond thrilled to find them in the box, and I just happened to have a good idea for how to use them sitting in my stack of recipes to try. 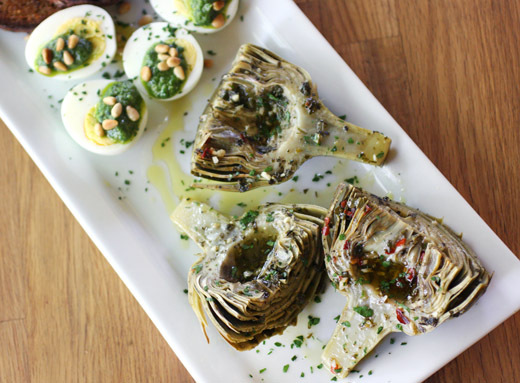 In the March issue of Living, Roman-style braised artichokes were shown served with hard-boiled eggs with pine-nut sauce. I followed the recipe almost exactly for the artichokes and delighted in the aroma of garlic and wine from the oven as they cooked. For the eggs, I took a turn from the exact suggestion in the magazine since I had some arugula in my herb garden that I was planning to turn into pesto. I topped my eggs with the arugula pesto and a few extra toasted pine nuts for garnish. I used to live in fear of cleaning artichokes. It seemed like the most daunting task in the kitchen. I think I’m finally getting used to it somewhat. I’ve learned to work quickly, have lots of lemons at the ready, and focus on how delicious the finished dish will be. Having a bowl of acidulated water ready for the trimmed artichokes is key, and having a cut lemon to rub on each artichoke while you’re trimming it is helpful too. I pulled off the loose outer leaves, cut off the top, trimmed the stem and peeled it, cut them in half, and spooned out the choke before dunking them in the lemon water. A plate is useful to keep the cleaned artichokes submerged in the water. From that point on, this dish couldn’t be easier. The halved artichokes were placed cut side up in a Dutch oven and topped with white wine, olive oil, red pepper flakes, minced garlic, salt, and herbs. I used parsley, oregano, and basil from my garden and skipped the mint since I didn’t have any. The liquid was brought to a boil on top of the stove and then the dish was transferred, covered, to a 350 degree F oven to continue cooking for about 45 minutes. The eggs were simply hard-boiled, peeled, halved and arugula pesto was spooned on each with a few toasted pine nuts. 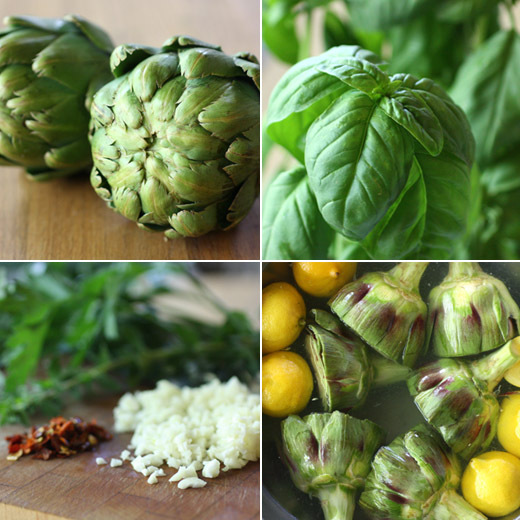 The artichokes were completely tender and flavorful from the wine, olive oil, and garlic. With the eggs with pesto, some crunchy, toasted bread, and a glass of wine, it made an almost perfect, light meal. The only thing missing was a view of the rolling, Italian countryside. Some day. Mouthwatering! Those artichokes look really good. I am definitely artichoke challenged, so I will live vicariously thru you, however those deviled eggs w/ arugula pesto are calling my name! I have been watching for baby artichokes in our local grocers. No luck yet but I can hardly wait. These artichokes look amazing! Really love the first click...so fresh and delicious. 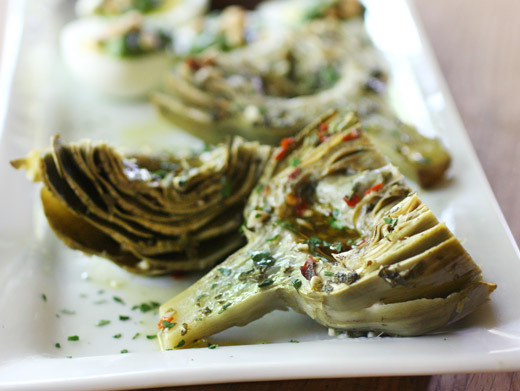 i've never eaten artichokes in this way; it seems like with me, they're always in a dip or on a pizza or salad. it's very appealing! Wow, Lisa! These look so incredible! Yum! I love this artichokes Lisa. The first photo is really appetizing. I love artichokes. They look delicious! Last fall we planted some in our garden but I don't think they survived the winter as we were not there. Shall know next week when we go back. I bought some at the farmers' market on Tuesday and pickled them! The beginning of this post had me picturing myself in Italy. This recipe looks and sounds delicious. Thanks for the recipe Lisa. Great dish! I love artichokes and am so happy they're in season at the moment. Definitely should give this a try. I'd love to spend several months living in Italy, and cooking. Our fantasy is slow travel - spend months in a place living there, then moving on to another location and doing the same, and so on. Anyway, really super recipe - thanks. That whole dish - the artichokes and the eggs - is so enticing. I am so looking forward to artichoke season. What a great repast for a warm evening. I can just envision myself with a nice chilled glass of white wine, kicking back with a plate full of these wonderful noshes. There's no question.... cleaning artichokes is NOT fun. But the results make it worth the effort. This is a marvelous dish, Lisa. I love the combination. Agree we could kick back, enjoy wine and the artichokes, imagining ourselves in Italy. Sheer heaven. I will show this post to my beloved... who knows, he might be brave enough to go for it!